Raymarine Dragonfly 5PRO has an average rating of 3.83 out of 5 based on 6 user reviews. Dragonfly 5PRO is Raymarine’s latest offering and it comes with all sorts of bells and whistles such as CHIRP sonar. CHIRP is a wide spectrum sonar technology. It basically means more signals are emitted into the water, resulting in better detail coming back to the unit. The end result is better clarity to help you distinguish what you are seeing. The new Dragonfly employs dual-channel sonar to bring you the best of both worlds. You get the advantage of a wide spectrum channel for better imaging of terrain combined with a conical channel that works to identify the fish. The down imaging on the 5PRO is accurate at depths reaching 160ft and the images it pulls offer photo-like clarity. The key to this superior sonar technology is the use of multiple frequencies. The benefit of utilizing several frequencies rather than a single frequency is that with each pulse the transmission goes across a wider spectrum which results in better images that are easier for you to interpret. Raymarine offers their WiFish mobile app to seamlessly connect your fishfinder to your smartphone or tablet. Practically, this means you and your fishing partner don’t need to jockey for the best view of the screen, just connect and you can see it right on your mobile device. This app also makes it easy to rewind and capture images. The screen is slightly smaller than the original Dragonfly (5in vs 5.7in) but it has the same resolution – 480 x 800. The Dragonfly has built-in optical bonding on its LCD display. In the past this feature was only available on high end marine devices, but Raymarine has recently integrated it into all their Dragonfly models. What this means to you is brighter colors and sharper contrast. On the water these are features that really make a difference. The Dragonfly will also never fog up. There are 3 different models in the 5inch Dragonfly series. 5PRO is gps/fishfinder combo, 5M is a chartplotter only, 5DVS is standalone fishfinder. When you buy the 5PRO or 5M you can pick from Jeppsesn’s C-MAP, Navionics, or Raymarines own LightHouse maps and charts. When you decide to invest in a fishfinder you want to know you are putting your hard-earned money into a product that will deliver. With its cutting-edge technology and almost a century of experience, Raymarine is an industry leader that you can trust to provide professional grade, cutting-edge sonar technology. You can get a great deal on Raymarine Dragonfly 5PRO here. The display on this unit is absolutely brilliant, much better than any Garmin or Lowrance sonar I’ve had in the past. I bought one with US Coastal Gold & Inland Lakes, not a very good map. No detail in the ocean, but that’s not Raymarine’s fault, I just need to upgrade to a better map pack. The fishfinder by itself is superb. 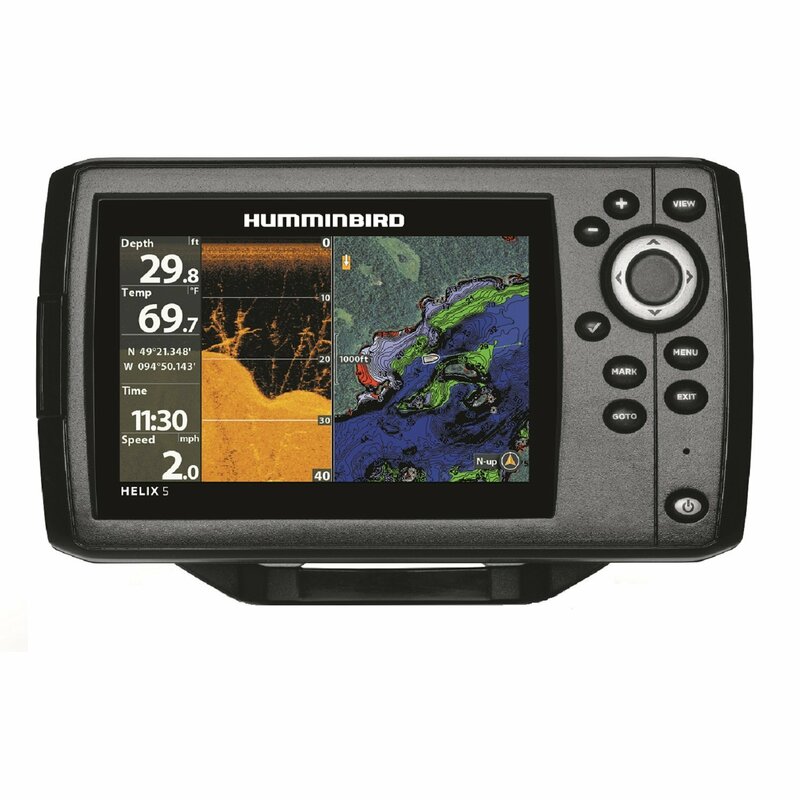 I recently bought a new boat and since the Humminbird 998si was a selling point on my old one I let it go with it. Having become accustomed to top end electronics I knew what I was looking for in a sonar/GPS. I was however hesitant to run out and drop another $1500 bucks without at least seeing what was else available and fit my needs. I saw an advertisement for Dragonfly somewhere or other and the name stuck in my head. I read up on it and was pretty impressed by the price, especially considering the stats. It had everything my old 998 had except for the larger screen. I decided that was not enough of a difference to justify spending the extra $1000 and saved a ton of money this time around. The installation is basically the same as every other unit I have owned. The only difficult part is routing the cables. The transducer is a bit larger than I expected and I was afraid it would get damaged easily, but it has managed to take several good licks and stay put and working like new. I was really interested to see if it could live up to the hype out on the water, and I was blown away. Switching from the massive 998si, I was concerned about the smaller screen size and visibility being an issue. I couldn’t have been more wrong. The horizontal orientation provides plenty of room for displaying everything you need. The display itself is sharp as a razor and the viewing angles are nearly limitless. My buddy and I were able to watch the fish swim by in amazing clarity from anywhere on my boat. The image was far clearer than my 998 even with the smaller viewing area. The level of detail on their 2d sonar is unreal. Where Lowrance and Humminbird use dual frequencies to scan, Dragonfly takes advantage of the full spectrum from high to low. There really is nothing out there I have seen that can come close on image quality. The controls are easy to pick up. If you can use an ipad you will have this one figured out in five minutes tops. The ability to connect other devices by wifi is a nice feature as well. I would more than recommend this for anyone from recreational to full time pro. You won’t get a better fish finder even if you shell out another thousand for a Lowrance or Humminbird. The display is crystal clear and bright enough to be read from anywhere on my 19 foot boat. Image quality and detail on down vision are every bit as amazing as they advertise. The GPS and maps are accurate and the full function navigation is nice to have. I do wish they had thought to include an anchor alarm but that is a pretty minor fault. The fish alarm makes plenty of noise though – in my opinion a bit too much noise – but most of them do. I am happy with my decision to give Raymarine a try and will keep an eye on them in the future. If the Dragonfly line is any indication they are headed to the top in the sonar/fish finder/ marine GPS markets. This is a true high definition fishfinder. Lowrance models claim to have CHIRP support by simply adding CHIRP in the name. Raymarine gives you true high definition chirp and it shows in the quality of the output. Dragonfly’s display is also better than Humminbird or Lowrance, you can see that easily by comparing units at a store (make sure you’re in a well-lit area). Also, get a separate battery to avoid interference. Do yourself a favor and spend a few extra bucks on a good fishfinder like Dragonfly, I’m glad I did. The sonar is wonderful, very clear images of the bottom. Not great though, lack of battery voltage display. Even my 10-year old Eagle fish finder had the voltage menu.